In January of 2011, Ryan started throwing up. It seemed he had a flu bug, but then he became worse. After much testing and lots of visits to the pediatrician, it was determined it must have been a neurological disease. An MRI at Children’s Hospital Colorado confirmed Ryan had a 4th Ventricle Anaplastic Ependymoma. Within days, Ryan had a partial resection of the tumor. The tumor had metastasized, so Ryan had chemotherapy injected directly into the spinal fluid. Ryan then had thirty-three days of chemotherapy and radiation. In May of 2011, Ryan had a second surgery and all of the tumor was resected. Ryan then had three rounds of chemotherapy, followed by a third resection of dead tissue, and his last round of chemotherapy in the fall of 2011. Ryan continued to have observational MRIs and was cancer free for five years! Ryan experiences some deficits in speech, hearing, cognition, gross and fine motor skills, and swallowing, but despite his challenges, he is continuing to get stronger. Additionally, he takes growth hormone and synthetic thyroid medication. In May of 2016, Ryan started having pain where his original tumor was that Tylenol and ibuprofen were not helping. He had a CT scan showing his ventricles were okay and that his shunt was working as expected. The pain did not lessen, and within two days the radiologist and neurosurgeon requested an MRI for swelling and questionable tissue. The MRI showed Ryan had a recurrence of the tumor. It was in the area where the pain was and it was small. He had five days of GM-CSF injections, in hopes that his body would attack the tumor with its own immune cells. On June 1st, all of the tumor was successfully removed. It was encapsulated and removed without causing further nerve damage or neurological effects. Ryan then had five days of radiation over two weeks. He had an MRI in August that showed no tumor! Ryan went home to be with Jesus on May 1, 2017. Ryan had his third occurrence of an Anaplastic Ependymoma brain tumor in December 2016. Ryan loved to play. His favorite superhero was Superman. 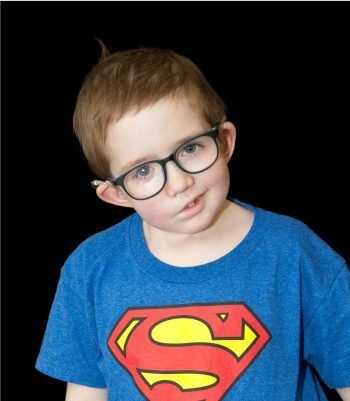 He had a different superman shirt for everyday of the week along with everything else possible Superman. Among his favorites were his flashlights, wallet, jacket, Superman dog, and blankets. Some of his other favorite toys were Curious George, Paw Patrol, Peppa Pig, firetrucks, police officer stuff and many costumes. Ryan enjoyed playing at home with his brothers and sister. He also really liked watching videos on you tube, painting and drawing. He loved to swim, trips to the zoo, and amusement parks. Ryan absolutely adored his friends and loved to play with them. Ryan always looked forward to going to school to play with his classmates, para professionals, and teachers. His joy always filled the room wherever he went and he was loved by so many people.